The way to present your eLearning content to your audience is critical. Engaging your learners requires a creative approach to visual design and, more often than not, effective online presentations are creative presentations. Luckily, there are several tools you can use to build your own presentation in the market. These are some of the most creative ideas to consider while creating online presentations. Animations don’t just eliminate language barriers; when used properly, they can turn your online presentation into an almost cinematic experience. However, as it happens with images, they simply don’t work if they are distracting. They can easily get irritating, so choose them carefully and don’t overwhelm your online presentation with lots of bells and whistles. Use tasteful animated characters to demonstrate key points and communicate your more complicated topics. Adding a podcast can be a very creative idea with respect to online presentations for eLearning. There is a variety of free podcast tools for creating your own cost-effective, approachable, and high quality podcasts. You can use them to incorporate stories, interviews, or even well-crafted open-ended questions. Podcasting, when done right, is a great way to engage your audience, especially its auditory members. The eLearning videos can optimize the effectiveness of your online presentation, as long as you don’t use them too often; a maximum of three short video clips is more than enough. A good idea is to use well known movie clips, as when your learners recognize the material it is easier for them to make connections with the eLearning content presented. Furthermore, you can create and produce your own eLearning videos, so that you can be more focused on your eLearning content and directly communicate your eLearning objectives. Adding a soundtrack to your online presentation will truly take it to another level. Music creates emotional responses, as it tells things words cannot express, communicates a feel-good vibe, and instantly connects people. Furthermore, strong melodic hooks become easily memorable, as they grab the attention of your audience and slip the parts of your eLearning content that are surrounded by music into their long-term memory. Just remember to give copyright credit to the composer and obey licensing laws. An online presentation should never be a static activity. On the contrary; the more your audience participates, the more effective it is. 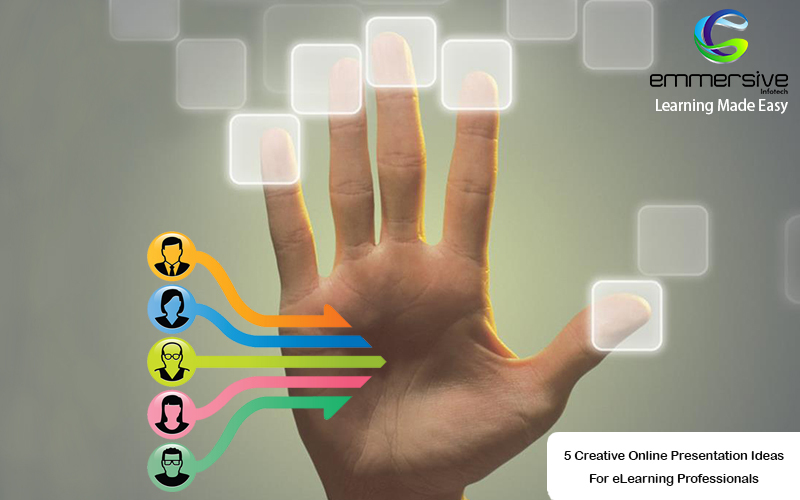 Integrate as much interactivity as possible into your online presentation by including scenarios, eLearning games, and drag and drop interactions, always making sure that your navigation system is easy enough to use. Once your learners interact with your eLearning content, their levels of engagement automatically raise.